A decent week saw four winners with a raft of hard luck stories and promising performances that made for a consistent period rather than an outstanding one. The four winners were backed up by six placed horses from fifteen runners. We'll start then with SOLESMES who scored for the second time in her debut season, taking the six furlong juvenile claimer in the hands of David Egan at Lingfield on Wednesday. It may have been a modest affair but she travelled well throughout and although she was pressed in the final strides by the fast finishing Capla Gilda, the Boss's homebred did enough. "She's done nothing wrong and all she does is please. She's tough, straighforward and will keep winning little races. This looked an obvious race to go for because she may not be entirely advantaged in nurseries at present and as a first foal of a mare of ours at Norman Court, we need winners on the board, not a pat on the back." In the evening it was another Norman Court homebred, ICONIC BELLE who continued her burgeoning relationship with West Ilsley apprentice Scott McCullagh as the pair made it two wins from three runs together to take the Class 5 mile and a quarter handicap for four year olds and upwards. It was only a three runner contest but that wasn't ICONIC BELLE's fault and in a truly run race, Scott dominated proceedings, setting a generous tempo before stretching his rivals at the three pole. She was attacked on both sides in the closing stages as first Clenymistra and then Beat By Beat By Beat had their say but it was impressive stuff from both the Sweet Partnership's four year old and her young jockey as Mick admitted. "Great stuff and it's great for both ICONIC BELLE and Scott who has struck up a good rapport with her. "He's clearly got plenty of talent and wasn't tempted to go for the kitchen sink approach as they closed in - he held her together and rode her out to good effect. "As for the filly, this is her third win of the year now and she's become very consistent. Another for Sixties Icon and the stud and great for Clive and Keith who had to wait for a while to see her get her head in front." It seems absurd that we are only now talking of JAZEEL's second career success but that is indeed the case after he finally returned to the winner's enclosure on Thursday at Sandown. Abdullatif Al-Abduklrazzaq's three year old son of Roderic O'Connor has always been game and consistent - having won on his second start as a two year old he'd been placed in six of his eleven races to date. Thankfully, things finally got back on the winning track under Andrea Atzeni in the Class 4 mile and a quarter handicap for three year olds and upwards. Settled in rear throughout, JAZEEL seemed to relish the opportunity to stalk a very generous pace before being asked to assert two furlongs from home. This he did in convincing fashion, switching to the outside to run out a convincing victor and justify favouritism to the relief of his trainer. "That's been coming for a while but I must admit it's been very frustrating. That's no reflection on JAZEEL, he's an absolute smasher who has only ever tried his heart out but at this trip and with a decent pace, that might well be the making of him. "He'll obviously go up from his mark of 80 for that and we'll see where that leaves us but he's only now coming in to his own and I'm a big fan of his." On Saturday, Peter Taplin & Sue Bunney's KOEMAN took Ascot's finale as he and John Egan took the Class 3 mile and a half handicap in gallant fashion under top weight. They went a suicidal pace up front that left the field, with Koeman well off the pace, strung out like washing. Gradually though the leaders came back to them as they turned for home and KOEMAN was asked to go and win his race over two furlongs from home. He certainly got there soon enough and was then asked to fend off challengers from a long way out but he did so admirably, holding off Bajan Gold in the dying strides to the delight of MRC. "This is a smashing horse who has had his fair share of hard luck stories this season. He's getting better and better and although he's in great nick right now, I can't wait to see him next season. "I think he'll get further as he gets older and he's the type of horse who makes you dream of a tilt at the Ebor and races like that. There's a hell of a lot of improvement to come and I'm absolutely delighted for Pete and Sue." Sunnier climes beckoned last week, hence the lack of word on our winners who, in the last nine days have included CHIKOKO TRAIL, WHY WE DREAM, CHYNNA, FANNIE BY GASLIGHT, and JUNGLE JUICE who prevailed for a debut success at Wolves yesterday evening. We'll start chronologically though as last Tuesday saw Dave & Gill Hedley's homebred CHIKOKO TRAIL deliver at the fifth time of asking under Graham Lee at Pontefract. It was a game showing as the son of Sixties Icon relished the fast ground to confirm he's steadily becoming a major force in his grade as his three year old career blossoms after two introductory efforts as a juvenile. The Class 5 one mile handicap saw CHIKOKO TRAIL emerge as a victor off of a mark of 64 and there's clearly more to come as he's only just coming in to his own - he travelled comfortably in midfield before they turned for home and he ran away a ready winner to score by a length and three quarters at odds of 16/1. Mick was obviously pleased and although the price wouldn't suggest he'd win so convincingly, he's the type that the Boss expected to deliver sooner rather than later. "That was impressive and he's clearly coming on in leaps and bounds. We got him going at the back end of last year for experience more than anything because he was never a precocious two year old and his two runs were needed to set him up for this year. "He was fourth on his reappearance in May and ran well in an apprentice hands and heels event at Salisbury last month to finish third. He's been allowed to enjoy himself and has flourished as a result. Graham got the job done and I reckon there's a lot more to come this season." On the same card, it's worth mentioning PATTIE's third in the Listed Pipalong Stakes. Yet another from our Sixties Icon production line, she's done us proud and continues to run well at a high level. Two days later at Carlisle, Jon & Julia Aisbitt's WHY WE DREAM also entered the winner's enclosure for the first time after a string of game efforts. Another individual who benefitted from dipping her toe in the water at the track as a juvenile, the daughter of Al Kazeem has certainly knuckled down in 2018, finishing second at Newbury, following that up with two third placed efforts at Lingfield and Goodwood. She then ran with great credit to finish midfield in the Sandringham at Royal Ascot before confirming that she was a winner in waiting under Ben Curtis on Thursday. 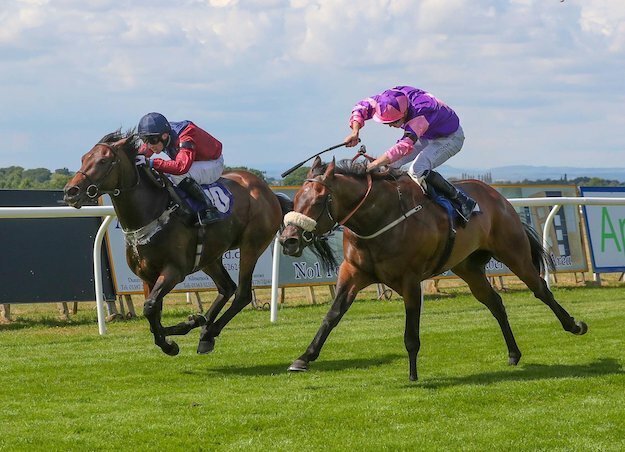 It was a battling effort as well as she took the Class 5 extended seven furlong novice event for three and four year olds by only a neck, holding off the concerted efforts of Bin Makfi. This looked a golden opportuity to get her head in front and with the others, including the odds on favourite Algaffaal well in arrears, Mick can look forward to a filly with a future. "She's was only rated 79 but she's better than that and has gone up to 81 now. She's a homebred of Jon & Julia's and we trained the dam Sandreamer who was very talented. Because of that, our job is to maximise her potential and see how high we can go with her - black type is obviously the aim." Indeed, the breeding theme resonates throughout this update as it was Mick's very own CHYNNA who also broke her maiden tag last Friday as Franny Norton delivered the juvenile daughter of Gregorian to take the five and a half furlong novice stakes at York. This was a decent victory from CHYNNA who was bang on the bridle at the two pole and travelled into the race superbly. On her fourth start, she was then asked to battle all the way to the line as Flawless Jewel pestered her every inch of the way - CHYNNA prevailling by a neck. Mick was delighted that she's stepped forward after returning to the track last month following a break after early season efforts. "We got her going real early on in the season and she showed up well at Newmarket and Kempton but it was clear that she was a filly who was growing on us so we just stepped off the pedal for a few weeks to let her get over two solid runs. "She came back to finish third at Windsor two weeks ago and that probably put her spot on for the York win. "She was worth giving time to and, seeing as the owner agreed that's what we did and she's a filly with a great attitude and a high cruising speed who will flourish from here on in. Again, she's a homebred so there's only one thing in mind." Yet another homebred, Aston Bloodstock's FANNIE BY GASLIGHT made her first return to the winner's enclosure as Silvestre de Sousa brought home the daughter of Sixties Icon on her handicap debut at Salisbury on Saturday evening. Having failed to land a blow in maiden company on her previous three starts, FANNIE BY GASLIGHT found the Class 6 mile and a quarter handicap for three year olds far more to her liking and she stormed home off of a rating of 65, coming from last to first to take the race comfortably by three parts of a length. Mick was pleased that one of his homebreds has come good again. "Whatever you say about her, you can't knock her heart. She's struggled this year but it was a question of getting her a mark and letting her find her feet at her level and she certainly did that nicely. She's gone up to 69 as a result and it'll be interesting to see what that has done for her confidence because she clearly relished the drop into that company." Last but by no mans least is Insignia Racing's JUNGLE JUICE who won on only her third ever start at Wolverhampton last night to yet again highlight the remarkable freshman year being enjoyed by her sire Bungle Inthejungle. This may well have only been a seven furlong median auction maiden on the all-weather but there's a lot to like about JUNGLE JUICE, a filly who ran out convincingly in a fast run event under Franny Norton. She was only beaten a head on debut at Goodwood in the middle of June and she did nothing wrong in finishing third at Wetherby only a week later but she stamped her authority on yesterday's race by jumping spritely from her handy draw and quickened up nicely to tag the long time leader Al Motajaz as they straightened for home. Mick was pleased for everyone concerned. "It's always a worry when a syndicate has a filly run so well but get chinned like she did on debut and then finish as a beaten favorite next time up. You just want them to get a win on the board! "We did that last night though and I'm delighted for Tina Dawson and her syndicate in Insignia. This filly isn't a typical Bungle in that she's got a bit of stamina on her dam's side and she may well get a mile later on. "It doesn't really matter right now because she's got a great temperament and, just like her dad, she's a proper type - a racehorse with a great attitude. So, there you go - again, apologies for this tardy and time demanding update. It's probably wrong to take any time off in the middle of the flat season but I'll leave you with an image that might explain things. 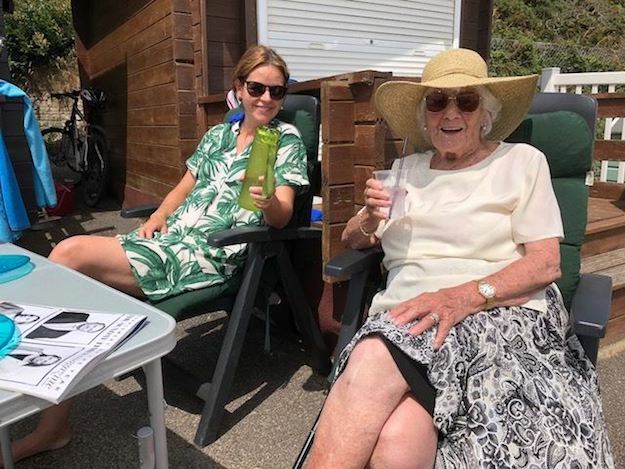 We're all homebreds you see and Gramdma went to the exotic climes of Bournemouth this week and enjoyed a gin & tonic or two at a beach hut. I'm sure you'll understand. To paraphrase Barry Davies, "Look at her face - Just look at her face!" It's been an in and out period but the winners are still there - it's just been a bit patchy of late. There's still plenty of cheer though as CARAVELA won a thriller at Newbury last night whilst HATS OFF TO LARRY continued his consistent performances and Scott McCullagh rode his first winner for the yard. We'll start with Jon & Julia Aisbitt's CARAVELA last night though and a smashing ride from Silvestre de Sousa, although it was a close run thing as the long time leader was only collared in the shadow of the post. Having lost her maiden tag in September at three, the daughter of Henrythenavidator has made a promising start to her 2018 campaign and got off the mark on her third start this season as SDS had to sit and suffer before bringing the top weight home. Dropping back in both grade and trip, CARAVELA was slowly in to stride in the Class 5, mile and a quarter handicap for four year olds and upwards. She was clearly travelling within herself all the way round but it was a question of when the gaps would appear in the closing stages and just when it seemed everything was working out to perfection, a gap closed as soon as it opened at the furlong marker meaning that the last 200 yards were all she had to reel in Jean Genie have been switched inside. But she got there - just - leaving Mick relieved and delighted. "This filly doesn't help herself at times as she often struggles to find her stride out of the gate, but having said that, she also needs to be allowed time to get into a rhythm and relax in her races. 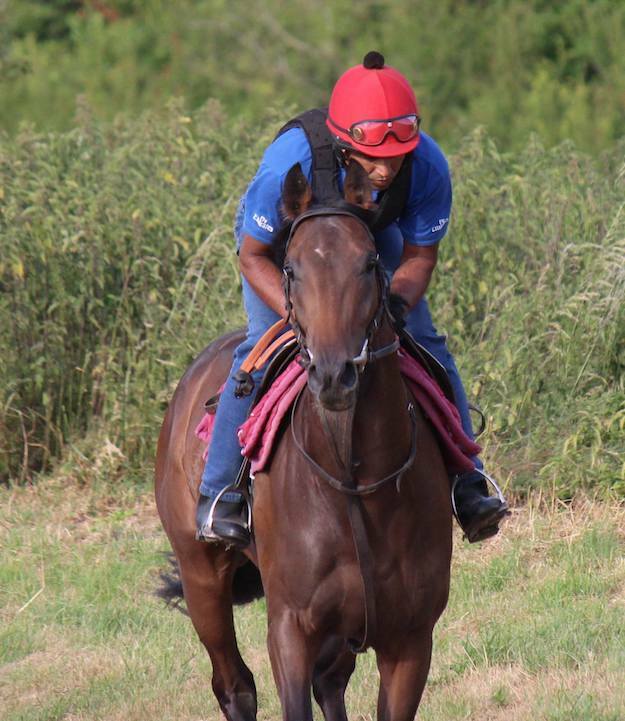 "Silvestre didn't panic, although I did when the door closed with a furlong to go and she only just got there on the nod! "She's done everything we've asked of her this year, inproving on her Brighton reappearance in May to finish third at Lingfield three weeks ago. "The Jean Genie was only a short head behind us on that occasion and they've finished, stride for stride exactly the same this time around in a lesser grade. "She's got plenty to build on after that and she will go in again. Fillies like her can blossom in the second half of the season and I see no reason why she can't because she's got a lot going for her. On Monday evening at Windsor, HATS OFF TO LARRY continued his upward curve with victory under Charlie Bishop at Windsor. He recorded his first career victory at Beverley two runs ago and ran creditably at Chester last time up finishing fourth in a blanket finish. Monday only saw three runners line up but his victory confirmed the notion that the son of Sixties Icon has become a reliable competitor who is now coming intro his own. Off of a mark of 73, three pounds higher than his maiden victory, HATS OFF TO LARRY took the Class 4 mile and a quarter contest in convincing fashion, staying on strongly to account for Oh It's Saucepot and the favourite Bid Adieu to please the Boss who has always had a soft spot for William Harrison-Allan's four year old gelding. "He's a lovely sort this with a big frame and he's always been willing. He was consistent last year and was always thereabouts but having him gelded and getting another winter behind him has seen him come good. "He looked like a stayer to start with but bringing him back to an extended mile and a mile and a quarter - that looks like his trip because he can grind it out if there's a decent pace on. "That was a worry with only two to race against but they went a good clip and that played into his hands." 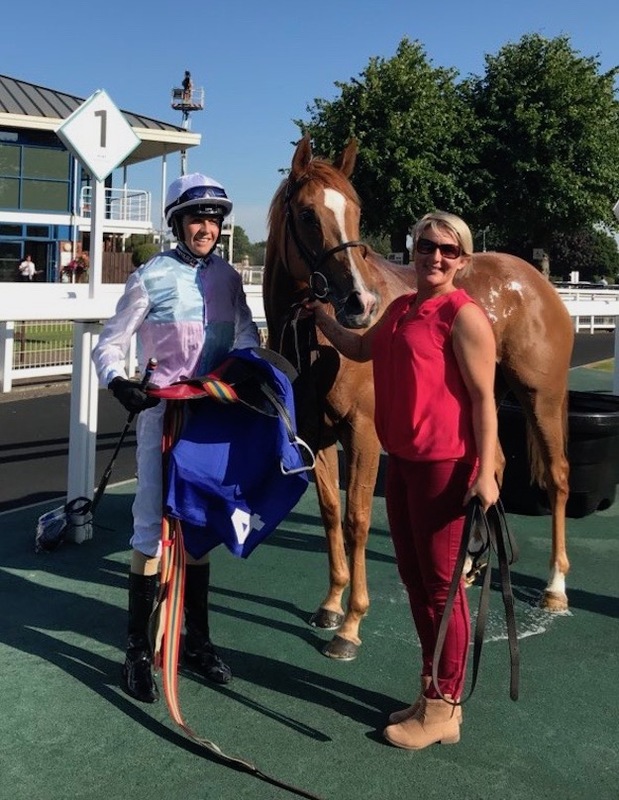 Lastly, mention must go to Scott McCullagh who rode his first winner for West Ilsley last week at Nottingham as ICONIC BELLE took the hands and heels apprentice race in fine style. This went unreported on these pages, mainly because our intrepid reporter needed a break from Coventry and sent himself to Warsaw on an ambassadorial role to take in the delights of the Polish Derby. The delights of the Sweet Partnership's ICONIC BELLE have only just been realised in 2018 as the daughter of Sixties Icon took until her four year old campaign to break her maiden tag but she's up and running now, that being her second win in five outings. "Good for Scott to get off the mark for us and ICONIC BELLE is a willing partner. He's ridden winners in Ireland and is more than competent and he'll hopefully improve for a change of scenery with us. "He didn't get it right yesterday in a similar contest at Yarmouth but ICONIC BELLE was carrying a penalty for her Nottingham win, so let's just say he's got plenty of ability but plenty to learn. "He will though because he's got a good head on his shoulders and is willing to work hard. The rest will look after itself." A smashing performance from the Boss's very own THE NIGHT PORTER last night saw yet another of Sixties Icon's progeny break his maiden tag by taking the Class 5 mile and a quarter maiden for three year olds and upwards convincingly under John Egan. Unraced as a juvenile, THE NIGHT PORTER was returning to Beverley where he finished fourth over seven and a half furlongs only ten days ago and the step up in trip certainly proved to be to his liking as he stretched clear of his five opponents to record victory three lengths ahead of Le Maharajah and Roddy with the rest a long way in arrears. This was a very satisfying performance for an individual who only made his racecourse debut at the end of May and Mick is looking forward to what's in store. "We had to give this lad time because he was a very scopey and gangly juvenile who was all over the shop last year and, I'll be honest, I didn't know what to expect when the new year came. "To our delight, he thrived and once we got him going in the spring you could tell that he had a bit about him and his third placed finish on debut at Brighton was very encouraging. "He'll do well from here and he's got a lot going for him. He's another from Norman Court Stud - his dam was tough and won six for us but, interestingly, she's a half sister to Samitar, so you could say THE NIGHT PORTER has plenty going for him after a promising start to his career." 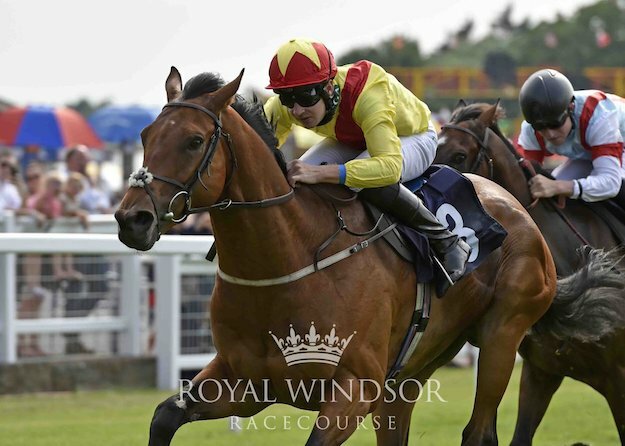 A pleasing win for Box 41's KNOCKABOUT QUEEN who took the juvenile six furlong seller at Windsor last night to get the syndicate off the mark for 2018, the daughter of Sixties Icon being bought in at the ensuing auction for 10,500 guineas. This was the fourth time of asking for KNOCKABOUT QUEEN who finished down the field on debut in a very green showing before stepping up on that with a third placed effort at Brighton. 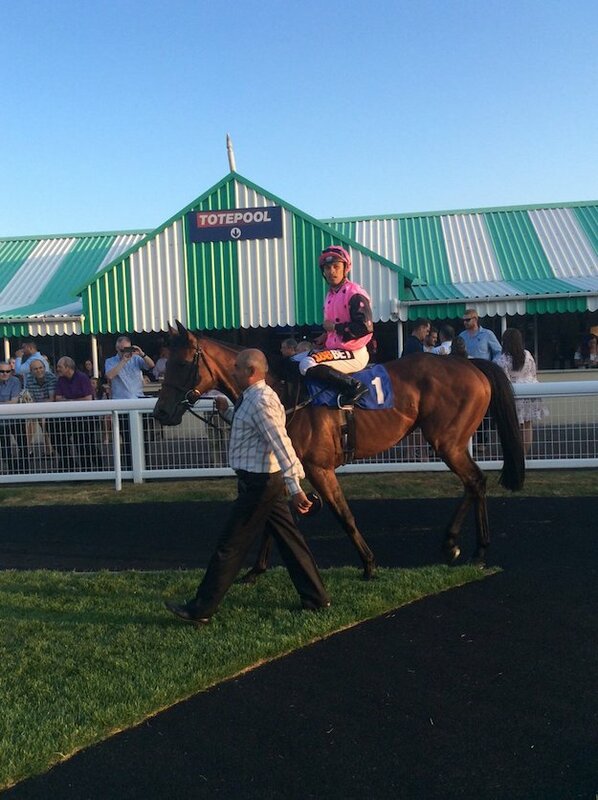 She again showed promise next up at Beverley but the Boss was keen to get her on the winning trail and she did that convincingly under David Egan last night. She stalked the leaders before asserting pressure at halfway and emerged from the pack in the final quarter mile and ran away to win by over three lengths. Mick was delighted with that and is looking forward to more. "She did that very nicely and having trained the mother, this is a filly who I was keen to get going because she's tailor made for racing, it's was just a matter of getting her head in front. "The dam, Rough Courte was tough and hardy and KNOCKABOUT QUEEN is yet another to come from Norman Court Stud and although she's only won a seller, she much better than that and it'll be interesting to see how she develops with such a confidence boosting win behind her."